Years before the first astronauts set foot on Mars, scientists will already be there – virtually. Thanks to a collaboration between NASA and Microsoft aimed at advancing human-robot interactions, the space agency’s OnSight software will allow researchers to explore a virtual Martian landscape created from data sent back by the Curiosity rover. NASA’s Curiosity robotic explorer may be a nuclear-powered technological marvel, but looking at its data through a flat screen is a bit like trying to do surgery by postcard. Even 3D images created using stereographs are still very flat and lacking in perspective, depth, area, or context. What scientists want is a way to look at that data that allows them to recreate the area around the unmanned rover as a 3D virtual environment where researchers can meet and study phenomena in context. The OnSight software was developed by NASA and Microsoft as part of an ongoing partnership to advance human-robot interaction. It works with Microsoft’s Hololens, which is a wearable Windows 10 computer hooked up to a high-definition 3D head-mounted display with holographic lenses. 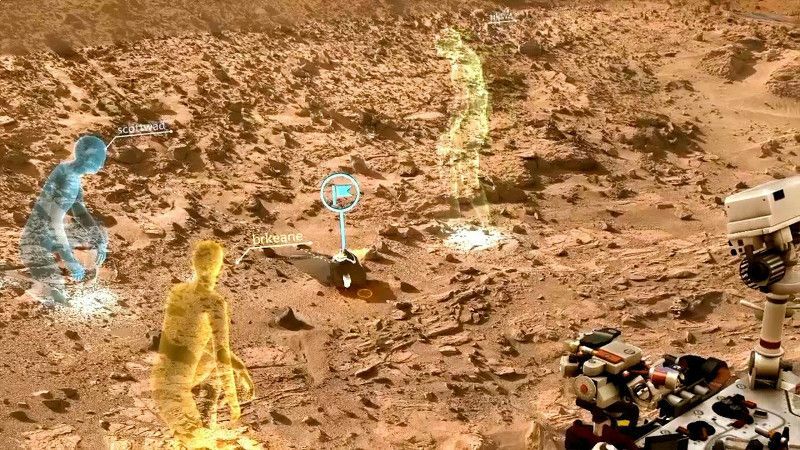 With the headset on, the data sent back by Curiosity is mapped as a 3D-simulated environment where avatars of scientists can meet, walk around and study the area using augmented reality. In addition to studying data, OnSight can also act as a more intuitive planning tool and as an operating system that allows scientist to manipulate the simulation using gestures and menu commands. NASA says that the Jet Propulsion Laboratory (JPL) in Pasadena, California will begin testing OnSight later this year for Curiosity mission control operations. In addition, it will also be used for the Mars 2020 rover mission and other applications.